hi i'm new to this gardening lark having been an engineer for 50 yrs. I've never heard that. You don't remember your source? It would be interesting to know why. just spoke ( via translation from she who must be obeyed) to the local mango man and he said its the fruit skin that contains a toxin but its OK to use the leaves and fallen fruit as mulch. It's possible, walnut leaves will keep mice away but also help prevent the growth of competing plants, googling seems to indicate similar results for mango. Tough and shiny leaves take longer to break down but even banana leaves (full of anti-microbials) will decompose given a good mixture of materials. The answer for compost is C to N ratio, aeration, moisture content and the right microbes. In the case of mulch for the most "stubborn" stuff, try reducing the particle size and prewilting before application. A full banana leave is an umbrella not a mulch. Will watch that project with interest. Good luck one engineer to another. Go for it , my shredder was made by a local one-man band, and his mate it works well, a bit rough around the edges. A lot has been posted on here about chipper /shredders ,a good few companies in Thailand make them, have a look at TV history ,a shop near me sells them, with a 7hp petrol engine about 25 000 baht.
. Sorghum is a good feed for cattle, but young plants contains hydrogen cyanide poisonous if cattle eat a large amount, but when made into silage the toxins will be destroyed, due to the ph dropping in the fermentation prosses, making it safe for cattle to eat. Something I forgot, all that green matter the compost will produce heat ,that heat should kill any toxins ,along with the composting prosses . But don't underestimate the value of those "umbrellas", they temporarily fulfill some of the functions of a proper mulch, by suppressing competing weed growth and retaining soil moisture. 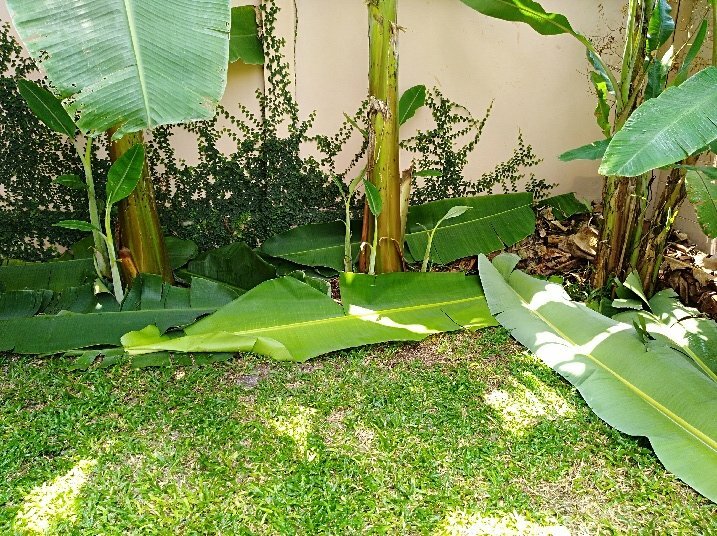 Within a week the banana leaves start to shrivel and become part of the underlying, decomposing mulch layer. When I take out a culm, after fruiting or to thin the clump, I dump the cut stem parts under the remaining plants and put the leaves over it all. I find it to be a good mulching process. In my opinion, it is always best to mulch with the parent plant material. It's natures way, that the leaf litter and fallen branches decompose and replenish the actual minerals that the plant took up from the soil for growth. I read that it's better to clean up mangoleaves against pests and diseases. You'll harvest more mango's without leaves all over the place. I disagree and think the information is incomplete, What's the context of that recommendation? What specific pests and diseases is the author referring to, and what other factors in the soil and water management and IPM practices might have been better done to address pest and disease suppression. To me it's like saying don't drink water because it could be contaminated with some bad stuff. Water is important and so is leaf litter mulch. You can get clean water with a little effort, and If a grower bothers to study the IPM for the plants and products he/she is working with, he may find a way to keep the mulch and all the amazing benefits, while suppressing the diseases or pests he was blindly afraid of allowing habitat. Leaf litter mulch is free soil organic matter input, and it enhances conditions for beneficial soil organisms, soil moisture retention, weed suppression, and therefore conserves expenses for fertilization, irrigation, weed control. Fertile soil has built in biology for suppression of soil borne pathogens, and it supports plant nutrition that builds plant resistance to pests and diseases. And then, with that basic framework of soil fertility and water management (avoiding drought stress that makes trees susceptible to pests and diseases, or avoiding over-watering and root rot), you have a good start. Then by regular monitoring and identifying what disease or pest is present and is causing or is likely to cause problems, you can more intelligently and effectively target that issue with management practices or specific bio-pesticides if needed. Collecting the leaves is to prevent the crop from getting attacked by the typical mangodiseases. So you don't have to spray copper or sulfur or see your mango's getting ruined. The pathogens live in the old leaves on the ground and will infect the tree next season. If copper and sulfur fungicides are the only management tools that you have for disease control then sure, you better dispose of your infected leaf litter. But I'm just saying that a more comprehesive IPM program is worth considering and will pay off . "Typical mango diseases" are not universal. If you don't irrigate adequately could be one reason for susceptibility. My mango orchard didn't have leaf or fruit fungal or bacterial diseases and I never did any fungicide spraying, if I did it would be with biofungicide. IPM has a big tool box full of good management alternatives and yes sanitation is one of them. But I would spray the leaf litter with EM biofungicide before I would consider removing it. My mangotree (consisting out of 25 different grafted varieties) didn't give much fruit, i had all the mangodiseases one can imagine. I sprayed for a while but got tired of that. After cleaning the litter the next year i got more fruit. I culled that mangotree though, it still didn't give enough fruit for the space it was using. It's the same for durian in thailand, the professionals claim that the tree's can't get organic fertilizers because it might kill the tree's by fungus in the soil. They give them loads of chemical ferts. My duriantree keeps all leaves and even gets extra litter...it's still alive and looks good.